Stunning Keisha: R U Ready 2 Pawty?? R U Ready 2 Pawty?? Has this thing been scooped? CK, Campaign Manager to the Stars here. I've had a little something in my box and now it's time to scoop! You see, I'm proud to be working with Katie and I'm even prouder that we're representing Blind Cat Rescue and Sanctuary! 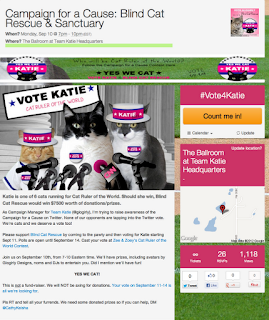 #TeamKatie will be holding a Get Out The Vote pawty and rally on September 10th from 7-10 pm EST on Twitter. I've been rounding up staff, entertainment and prizes. When Katie hired me, it was only partially for my stunning looks. It was also because I have a Twitter following and she knew that the Twitter vote would be impawtant if she wanted to bring home a victory for Blind Cat Rescue. Last week after she had a chance to talk on the phone with Alana Miller, the amazing woman behind Blind Cat Rescue, and learn more about the difference they are making in the lives of special needs cats, Katie was more committed than ever that these kittehs should reap the rewards of a #TeamKatie victory. Dare I say that when this campaign started, Katie wasn't polling very well. Victory was a long shot. With your help, furrends and anipals, we can defy the odds-makers and make those kittehs very happy. Did u think we could hold an impawtant election like Cat Ruler of the World without including u? Of course not! Katie is pretty new on the twitter scene and I'm holding her paw through this as I introduce her to our vast community of Twitter anipals. I know I can count on u. Come pawty w/us on the 10th. We'll be clinking Niptini glasses and dancing as we get out the vote on Election Eve. U can talk to Katie as she works the room. There'll be prizes—Yeah! how would u like one of those cool custom avatars by Glogirly Designs? We're giving away 6 of them—and noms but best of all, it's for a Cause! 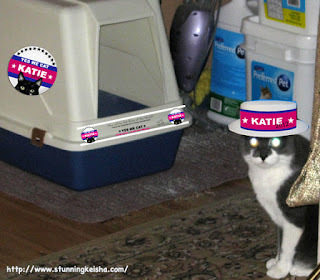 Katie has chosen to represent the amazing cats at Blind Cat Rescue & Sanctuary, in North Carolina. Should we pull off this upset—and it will be an upset—BCR would win $7500 worth of donations and gifts, from Halo, The World's Best Cat Litter, Zero Odor and PetPlan Insurance. Can u imagine that? Come pawty and then VOTE FOR KATIE AND BLIND CAT RESCUE starting September 11. For those who overindulge in Niptinis, the polls will remain open until September 14. Click the pic to RSVP. Make your reservations early because the Ballroom is starting to fill up. We can make this a reality! In case you haven't visited Katie yet today, please stop by. I hear we've gotten a very big celebrity endorsement!! Read a very special post about Homer the Blind Wonder Cat and read his endorsement of Katie and Blind Cat Rescue. I hear she's even having a contest! Yes we cat.....Bol funny. We are following with great interest. Have a fabulous Friday. And who better to throw the best twitter pawty EVER than my bestie, CK. The kitties of Blind Cat Rescue are already smiling. That Pawty sounds terrific. We will sure be there. We wish you lots of luck Katie. We luv that Blind cat Rescue. Take care. Niptini sounds delish!! You sure do know how to throw a pawty! Sorry, but even though Blind Cat Rescue is awesome I gotta stump for the equally-awesome Tabby's Place! I might sneak by for the pawty...but that guy from. the National Inquirier is still hiding in the bushes! Can you get that Romney a one-way ticket to Mars? We love a good pawty! We'll check it out! CK, you're doing a great job!! Darling, Are you going to working the Obama campaign once this victory's in the bag? Cause I think he could use you. Seriously. XOXOXO Off to Katie's now--I loves HOMER! Uh CK! Austin has Pawty Head Quarters TOO! Just yous wait! We sure do envy you Cathy Keisha - not only are you stunningly beautiful, but you know how to use Twitter.... Ugg... our human is all paws when it comes to that!! No post today--is that because you ran like the wind when your Mommy tried to take your picture, ha ha meow? I have a picture for Monday that I hope drives you WILD! Maybe you will allow your Mommy to take a nice sleepy shot of you? The reason we post so many sleepy shots is that that's the only time the Human can reliably get an in-focus picture of me. Lots of others are blurry shots of me turning away or walking away, heh heh. Uh--update: The picture that might DRIVE YOU WILD has been postponed till Tuesday since I hadded the chance to work with Kozmo on my verreh first FBI case!! We are investigating Callie's Catnapping. Coming into the Home Stretch. YES WE CAT!